In his shirt-sleeves, sensible helmet, shiny black shoes, suit trousers and restraining cycle clips, there's something about Nigel's overall cycling look that faintly screams “pervert”. Not that he cares. For him, cycling isn't about fun. It is simply an efficient way to get from his suburban semi to the station, and then from Liverpool Street to the office. Nigel has no interest in cycling culture, and is fond of telling people that being on a bike is no reason not to follow the Highway Code. 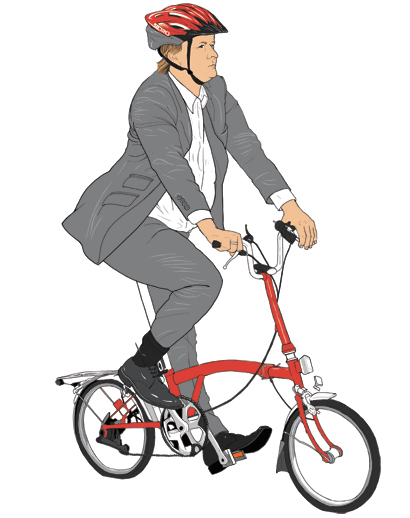 All the same, he is inordinately proud of his Brompton folding bicycle. When his wife borrowed the clip-on mini-pump without telling him, he sulked for the whole weekend. Commissioned by The Times to illustrate a selection of biker tribes for The Great Outdoors supplement.